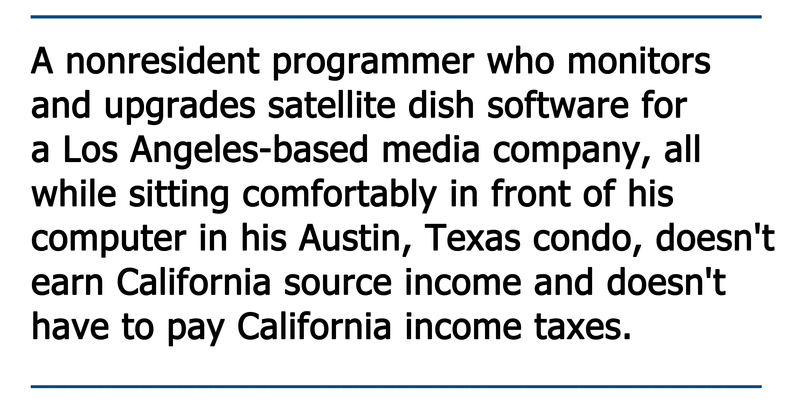 Generally if you work in California, whether you’re a resident or not, you have to pay income taxes on the wages you earn for those services. That’s due to the “source rule”: California taxes all income with a source in California. And for tax purposes, the source of income from services is the location where the services are performed. This is true even if you are a nonresident, even if the contract with the employer is made out-of-state, and even if the wages are paid outside of California. You can imagine how important the source rule is for California’s taxing authority, the Franchise Tax Board, when it comes to actors and athletes. When LeBron James travels to California to play the Clips at Staples Center, California gets a cut of his pay for that night. But what if the employee is a nonresident who doesn’t have to set foot in California to perform his services? Then the source rule works for the nonresident. Remember, the source of the services is the location where the work is actually performed. 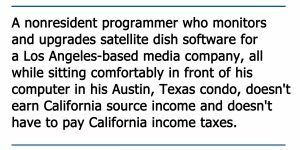 A nonresident programmer who monitors and upgrades satellite dish software for a Los Angeles-based media company, all while sitting comfortably in front of his computer in his Austin, Texas condo, doesn’t earn California-source income and doesn’t have to pay California income taxes. At the employer end, while California companies have to withhold state payroll taxes for resident employees wherever they perform their services, and for nonresident employees for services in-state, not so for nonresident employees who perform services outside of California. This is true, by the way, even if the employee is a nonresident corporate director (or an LLC manager or general partner) and is paid for his work directing the company – as long as he only participates remotely (though don’t confuse this with profit distributions to nonresident owners, which follow different rules I will address in a separate article). Note, this entire analysis assumes the nonresident is an employee of a California firm. If the nonresident is an independent contractor, different rules applies. Specifically, even if the independent contractor never set foot in California, if he is performing services for a California customer, he is likely “doing business in California,” which falls under a totally different set of stringent, complex rules, and which usually result in a tax liability of some sort. This problem also applies to out-of-state entities that perform services to California customers. See “Internet-Based Companies and ‘Doing Business’ in California: Be Careful What Your Website Says About You,” for an overview of those rules. Returning to our remote employee, so far so good if he hasn’t set foot in California. But what if a difficult glitch arises requiring the programmer to fly to Los Angeles to fix the system on site? Then everything changes. The source rule kicks in against the employee. 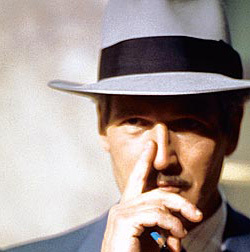 In that case, just like LeBron James playing at Staples Center, or Paul Newman (who was a resident of Connecticut) making a movie in Hollywood, California taxes the income from those in-state services. What the FTB does then is to use an allocation formula based on “duty days” – the days the employee is present in California and working – in proportion to total work days. The reason I mention Newman, by the way, is that he prevailed in a famous case against the FTB for his performance in “The Sting.” Newman was able to show that the duty days formula should be based on what his contract actually required for working in and out of California, rather than the FTB’s own calculation of duty days. Paul L. and Joanne W. Newman v. FTB (1989) 208 Cal. App. 3d 972. That’s why it’s very important to have a written employment contract that clearly states what obligations an employee has to work in California and what constitutes such work. In fact, the union contracts of professional athletes and actors usually meticulously define and limit duty days, because so much potential state income taxes are at stake. Highly compensated managers, executives and key personnel who work remotely may also have significant taxes at stake. So, they too need to make sure duty days and other residency language appears in their employment contracts. And as a practical matter, it’s very rare for any remote worker not to have to make some visits to California to perform work while physically present in the state. The more time spend in-state, the more tax is at issue, and the more pressing the need for dealing with duty days in the employment agreement. Note also that it’s easy for LeBron James to prove how many days he worked in California and how many days he worked outside of California. You just have to look up the NBA schedule. It’s not that easy for our programmer or other nonresident workers who perform services from their living room computers. Therefore, scrupulous record-keeping and detailed employment contracts are a necessity. If vesting stock options are part of the remote worker’s compensation package, the tax implications of duty days increase astronomically. That’s because the number of duty days may determine what portion of the stock vesting is allocated to work in California, and if the options are non-qualified or their characterization as compensation isn’t limited by a section 83(b) election, then they will be taxed as wage income. A share of that compensation will be prorated to California, as a result of the duty days spent here. Needless to say, if the options are related to a startup that hits the jackpot in an IPO or other sale or merger, the value of the options and hence the tax potentially due to California may be astronomical. The taxation of stock options is inherently complex. The duty days concept adds an extra layer of complexity. Therefore, any remote worker with stock options needs to have their compensation package carefully analyzed and managed for this vulnerability by tax counsel who understands California-sourcing rules. To summarize, working remotely for a California firm as a nonresident has the potential for significant tax savings, but there are important caveats. First, the entire favorable tax treatment of working remotely is based on the assumption that the employee is truly a legal nonresident. For employees who move from California to a lower tax state like Nevada or Texas, it’s important they follow residency rules and genuinely change their legal residency. If they don’t make the necessary changes to reduce or eliminate their California contacts, they may find themselves in a nasty residency tax audit. Second, make sure to have a written employment contract that spells out the services to be performed out of state and in state, if any. In this way you are in control of the “duty days” allocation, not the FTB. Finally, if any work is required on site (and it almost always will be at some point) keep good records of your work both in and out of state. This will allow you to make the most of the “duty days” formula allocation. That allocation is all the more important if the nonresident’s compensation package includes vesting stock options. If that’s the case, how duty days are defined or limited may make a tremendous difference in California taxes owed. Manes Law is the premier law firm in California residency tax planning, consultations, audits and appeals. We have over two decades of success assisting Californians who want to change their legal residency, businesses moving their situs to other states, and nonresidents working remotely for California businesses. Learn more at our website: www.calresidencytaxattorney.com.